A preview of the new Sony Smartwatch. Release date, specs, and hands on video. The world is becoming more connected. Thanks to the upcoming Sony Smartwatch it is becoming even more in sync. This state of the art new touch screen watch syncs with your smartphone and shares functionality. Read all there is to know about the Sony Smartwatch here! The Sony Smartwatch is the spiritual successor to the Sony Erickson LiveView which marked the first example of what would come to be known as a "smartwatch". The newer model promises to improve on the original in a number of ways. So what is so great about the upcoming Sony Smartwatch? Here are some key points of what we know so far. What Does the Smartwatch Do? It links your emails, SMS texts, social networks, and apps on your phone to your wrist, seamlessly. Now you can view updates sent to your phone without having the phone in your hand or even in the room. Oh yes, and it also tells time like a normal watch! 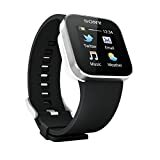 The Sony Smartwatch connects to your Android device via Bluetooth technology, sharing display data functionality. It is not a stand alone device, meaning that it is meant to work in conjunction with your Android device, not as a replacement for it. How is it Different than Past Watches? This year's model features a full color display, various wristband styles to choose from, and an accelerometer built in standard. Sony has taken customer feedback into consideration, making the device more intuitive and user friendly as well as better connected to the Android operating phone. How is it Different from Competing Smartwatches? The Sony Smartphone is not a stand alone device. Rather, it is an accessory to your existing Android device and is an extension of it. The main difference is that the battery life is much longer than similar products like the "I'm Watch" and the "Motorola ACTV". The Smartphone is compatible with with Android devices using a 2.1 or later operating system. Can you Remove the Device from the Band? It depends on your usage. With light use it should last a week, with moderate use it can last 3-4 days, and heavy use would mean charging it once a day. $149 is the retail price for the Sony Smartwatch. Q1 2012!!! The Smartwatch was just recently released. It is out now, available for purchase today (see below). On Sale Now! Recently Released! Great example of the awesome functionality!